The green building industry in Vietnam may still be in a nascent stage compared to its Asian neighbours, but it has certainly been gaining traction in recent years. Alongside Vietnam's stunning economic growth of the last decade - averaging 6.4 per cent per year - and with environmental sustainability as a Millennium Development Goal for the country, an interest in going green has slowly but surely developed. The establishment of the Vietnam Green Building Council (VGBC) in 2007 was a landmark event for Vietnam's green building industry. In a recent article, Melissa Merryweather, chair of VGBC, stated: "In this country there has been a lot of talk saying 'sustainable buildings are so expensive' and that's utter nonsense. People who've said that don't really know much about sustainable construction." Education about the benefits of building green is therefore a top priority for VGBC. The non-profit, which strives to raise awareness about the benefits of going green, educates young architects, engineers, building owners, local government and businesses about anything and everything one needs to know about developing the best sustainability practices. It also aims to dispel incorrect information about going green, such as exaggerated estimates on the costs of sustainable building. The latter concern is of particular significance, as Vietnam is currently experiencing a massive boom in construction. According to BCI Asia and CBRE Group Inc., the number of projects currently under construction totals 381, and is set to increase to an estimated 582 over the next 15 years. With the help of VGBC, major projects have been implemented and companies are becoming more educated and aware of the sustainable options available. The burgeoning demand for green infrastructure and buildings is set to be a major theme at this year's Vietbuild International Exhibition. Focusing on the construction, real estate, building materials and interior and exterior decoration industries, the annual event is the biggest exhibition of its kind in Vietnam and will feature new advanced solutions and products on sustainable building design, construction and operations. More than 800 companies from 22 countries worldwide - including South Korea, Japan, Thailand, USA, France and Sweden - will showcase their latest products and services at some 2340 booths set up in the exhibition. Vietbuild 2015 will also feature seminars on new construction technologies and products. 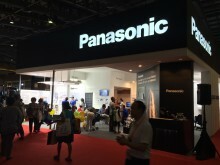 Among the key international companies at the exhibition, Panasonic will showcase some of its latest offerings for the residential market. Products that will be on display include a diverse and stylish array of wiring devices (such as switches and sockets), which aim to create a safer yet trendier interior for the modern home, energy-efficient LED lighting fixtures for the environmentally conscious consumer, and a variety of fans and water pumps designed for creating a comfortable and cosy environment. Items will be displayed in different areas of the booth - primarily living room, kitchen and bedroom environments - to help visitors better visualise how the products can be seamlessly integrated into sustainable design standards. Home owners, interior designers and property developers will be able to clearly see how much value can be added to a home that is being designed or upgraded with Panasonic's unique building solutions. For more information about how Panasonic's advanced solutions can benefit your home, we invite you to join us at our booth located at the Hall-A of Vietbuild 2015 -Saigon Exhibition and Convention Center (SECC). The exhibition will be open every day from 1-5 September 2015, 8.30am to 7.00pm. Admission is free.